I mentioned in my last food blog (about peeling almonds for Lamb Rogan Josh) that I wasn't one for posting recipes. However, that particular post got me thinking about how food preparation can vary in India compared to in the UK. Or how difficult it can be. And that perhaps writing about making dinner in Mumbai, would provide some useful tips for other expats (whilst also showing the folks back home some of the lengths one may have to go to make non-Indian dishes!). 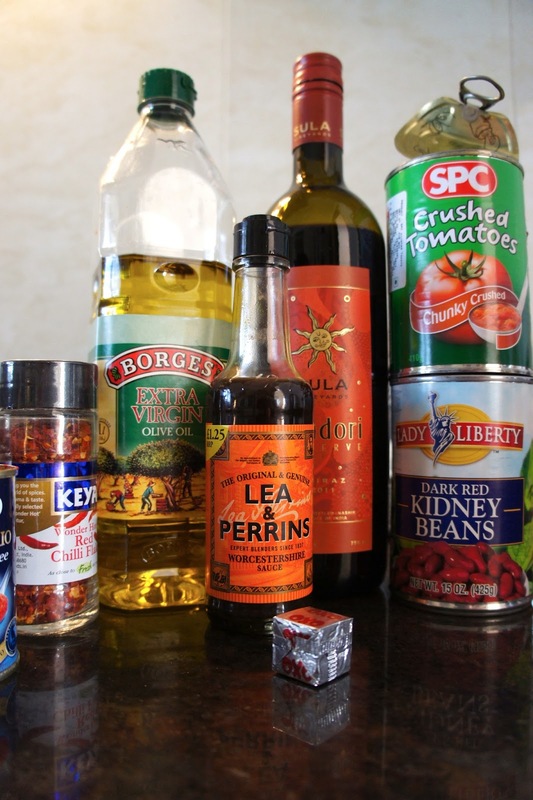 So here we have my favourite Chilli Con Carne recipe by Jo Pratt, which contains spices other than chilli - a subtle amount of cumin and coriander - as well as Brit favourites such as Worcester sauce and an Oxo cube. All the ingredients for this dish are available on Pali Market in Bandra and probably at Nature's Basket (branches around the city). Mr Jules also made a side salad to go with the Chilli - but I will talk about preparing salads in another post. A whole other story! On the same theme of having to peel almonds for my Rogan Josh (gosh, such an inconvenience! ), this blog is about beef - and mincing it (or grinding it if you are from the US). You can simply not (yet) get UK supermarket style minced beef in India. Don't forget that the majority of Hindu Indians do not eat beef anyway, so it can be quite difficult obtain it, let alone get it minced. You can buy minced beef from my favourite butchers - Joseph's in Bandra - but it is too finely ground for a majority of western recipes. Such as Bolognese sauce or beef-burgers. I think it is probably more 'Keema' in style. Hence why we have invested in a very handy little machine for grinding meat ourselves (available on Amazon, follow this link - you may have to pay for international delivery). Once you have worked out how to put it together, the rest is easy. You simply pass the beef through the machine whilst vigorously turning the handle, ending up with the sort of perfect mince that you will find at a supermarket back home. And because the beef from Joseph's is so lean (ask for 'tenderloin/undercut'), you will end up with a nice low fat bit of mince. All of this does require a little more effort than usual, but now Mr Jules and I have the ability to enjoy the perfect home-made Spag Bol, Chilli or Meatballs. Yum. My mincer delivered by Amazon - very easy to operate and it hasn't yet faltered after many many uses. Now that we've got that sorted, here is the recipe. I love the bit about adding the wine and then pouring yourself a glass! Heat the oil in a large, heavy based saucepan and fry the onion and garlic until softened. Increase the heat and add the mince, cooking quickly until browned and breaking down and chunks of meat with a wooden spoon. Stir in the tinned tomatoes, tomato puree, fresh chilli or chilli flakes, cumin, ground coriander, cinnamon, and Worcestershire sauce and crumble in the stock cube. Season well with salt and pepper, bring to a simmer, cover with a lid and cook over a gentle heat for about 50 minutes to an hour. Stir occasionally until the mixture is rich and thickened. Add the kidney beans and fresh coriander. Cook for a further 10 minutes uncovered. Taste and add seasoning as you feel necessary before removing from the heat. Ideal served with plain basmati rice and wedges of lime. You can also try it with french bread, guacamole and soured cream, jacked potatoes etc etc. This dish is even tastier a day or two after cooking when the flavours have developed and the texture becomes richer. undercut beef from Joseph's is so beefy you won't need it. Mr Jules's simple avocado and spring onion salad - will write about preparing salad another time. There is something in what you say about the texture of the mice here. I once got beef Mince for our Muslim cook for the legendary shammi kebabs that she makes. We only buy our beef from Joseph's - which so happens to be on our doorstep. The only beef that is remotely like a steak is the tenderloin (undercut). It is a bit like sirloin steak. We haven't been able to find rump or fillet. The undercut is fine for steak and chips - slice it a across and fry or grill it for maybe 5 minutes each side (depending on how you like it done). Sometimes we will have it with a baked potato and Mr Jules's homemade coleslaw. It's also very good in Beef Stroganoff - if you can get sour cream from Choice on Pali Market. We never get the beef ready minced because the texture is not good for western dishes - hence the mincer/grinder! But for kheema or shammi kebabs I would have thought it would be OK? I'd bought a tenderloin once from Jude's. Must try it again. I miss a good steak in india and my preferred meat here is pork. I've cooked with pork uncdercut. You might want to try Meghna Agro at Pali Market once and see how you find it. I am VERY loyal to Josephs haha! Besides, I got some chicken breasts from Meghna Agro last week when Joseph's was shut and I found them tough - even after cooking. The ones at Joseph's are peeeeerfect!